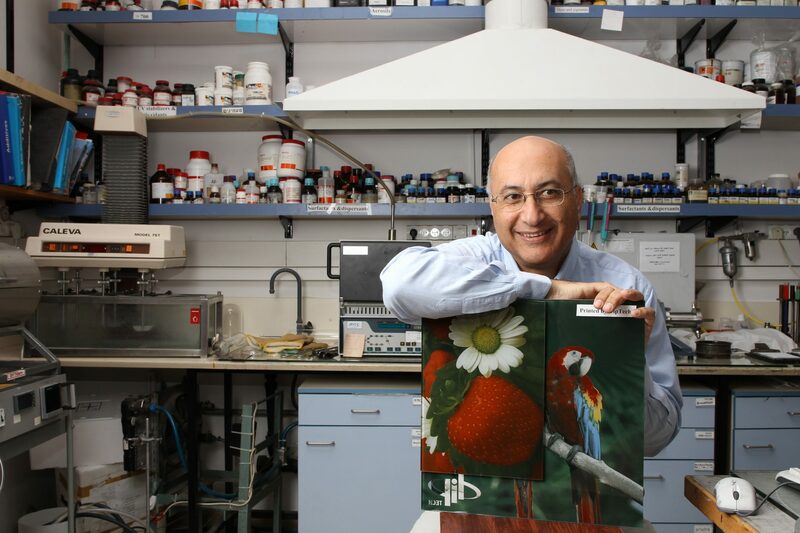 Hebrew University Professor Shlomo Magdassi was one of three recipients to win the inaugural Untold News Awards in November 2014. The Untold News Awards was started by Marcella Rosen as a means to showcase Israel’s achievements. An esteemed jury including Mr. David Schizer, former Dean of Columbia Law School and Dr. Barry Coller, Chief Medical Officer, Rockefeller University, selected the three winning inventions out of a large pool of impressive candidates. The winners were Professor Dan Peer of Tel Aviv University, who developed the “cancer bullet,” an injectable form of chemotherapy showing little to no side effects in trials targeting only diseased cells; Idan Tobis, an engineer who invented the ‘metal ligament prosthesis,’ through an arthroscopic procedure that reduces recovery time; and myself. AFHU spoke with Professor Magdassi about his award-winning invention. My invention is a bendable plastic touch screen display for smart phones, which can be made with a commercial inkjet printer, reducing the number of manufacturing steps from about 20 to only about four. The idea for it started a few years ago when I was exposed to the field of printed electronics, which had the need to create transparent electrodes. An example of a transparent electrode is the touchscreen on a smartphone and interactive displays. It’s transparent because you cannot see the conductors, and, it can feel your hand because it’s electrically conductive. Right now it’s made by a very complex and highly expensive method which requires a lot of sophisticated and expensive equipment. If a regular smartphone screen falls, it will most likely break. Our invention does all a current smartphone screen does, but is created in one quick, simple step of ink-jet printing, similar to what many of us have at home, but we use silver inks. If you use conventional printing, you see the print, because the lines creating it are large. We looked for a way to make the lines much thinner by using conventional printers. To do this, we took an idea from nature. If you have a drop of coffee on your shirt, it doesn’t stay in one drop. Usually, it will form a ring, which is called the ‘coffee stain effect.’ So, we replaced the coffee with silver. We made silver ink out of nanoparticles of silver and then saw we could form rings with the silver ink. Each ring has a line that is very, very thin [you would need a microscope to see the actual rings]. When you look at it, it’s transparent. But it is still conductive, so if you connect many such rings, when you touch it, it “feels” your finger. With our new technology, we can print all different kinds of shapes and save many steps in the process of creating the screens. This technology could be used for many optoelectronic devices. When a material becomes small, it may change its properties. With silver, if we just print silver particles, it won’t conduct. The particles have to merge to make electrical wire. Luckily, my lab at HU discovered that such particles can merge even at room temperature meaning you can make a conductor without heating, which is important for plastic electronics. Imagine that silver or gold particles start to behave as water droplets—when they meet, they merge. Interestingly, for many years I was working with companies trying to solve the coffee stain problem in printing (where you want the ink to form a solid dot). I took this problem and turned it into a solution. ClearJet, the company that will produce the bendable touchscreen, was established about a year and a half ago by licensing the technology from Yissum, the technology transfer company of the Hebrew University of Jerusalem. ClearJet started under the incubator of the chief scientists of the Ministry of Economy. The academic research that led to this invention was initially done at HU with the participation of two students, Michael Grouchko and Michael Layani. Beyond touch screens, ClearJet is now working with a Singaporean team to make smart windows that can be transparent or opaque. For example, if you have too much light coming in, you can turn the window off and use less air-conditioning. Now the company moved from under the incubator into the high-tech village on the HU Givat Ram campus. We already have several HU graduates working for the company. The chief chemist is Dr. Grouchko, who graduated from HU. In general, this technology is important for the field of transparent electrodes. For example, you can imagine an electronic newspaper. Anything that requires an electronic display would require these electrodes. If you were to use the present technique to make an electronic newspaper, you couldn’t fold or bend it. The coverlay (the cover), is made of ITO, which is fragile. Our invention allows making foldable and bendable electronics, or what is known as ‘plastic electronics.’ Just imagine in the future, the ability to take your iPad, roll it up and put it in your pocket. What’s next? With the advent of computers becoming more powerful and available, we can do many more things with printing. Now, I’m working on three dimensional (3D) and 4D printing–meaning, creating an object that can move, sense or emit light. My field is called colloid chemistry, which is the chemistry of materials in small sizes. Milk and face cream are everyday examples of products based on colloid chemistry. I started working with printing when I consulted for a start-up many years ago. At the beginning, I was working on graphic printing, which means to print basics like black, blue and yellow colors. After some years I started working in functional printing, meaning to print something beyond color that provides a function. For example, if we print silver or gold particles, we can create electrical conductors, and if we print some ceramic particles, we can make solar cells. I work with Professor Uri Banin, so we can print his quantum dots for signage, with Professor Yossi Paltiel to make plastic light sensors, and with Professor Guy Ron from the physics department to print 3D radiation detectors. It’s all about combining materials and using them to make functional items. Since our expertise is in making new materials, we can touch on a variety of disciplines. We have several international collaborations, for example with Singapore, China, and the EU. We have a long-term collaboration with NTU in Singapore in the field of nanomaterials for energy and water applications (together with Ben Gurion University). This is done within the international research center CREATE, which is under the National Science Foundation of Singapore. The Hebrew University has two programs in this research frame; the second one is led by Professor Ehud Razin. HU is an excellent place for research; we recruit the best people, the atmosphere is excellent and the infrastructure at the nanocenter is very advanced. This scientific environment is wonderful and enables excellent scientific achievements, as well as commercialization opportunities, through Yissum, the tech-transfer company of HU.